We’re thrilled to announce that the Ministry of Advanced Education and Skills Development has decided to publicly release the evaluation of its Literacy and Basic Skills (LBS) program that we carried out last year. The full report and executive summary are now available on the Ministry’s website, along with letters from the Deputy Minister and Assistant Deputy Ministers. Public release of evaluation reports is an important driver of transparency, and communicates a genuine commitment to act upon the evaluation results. It also allows for healthy open discussion and debate about the evaluation findings and recommendations. In fact, this is already happening across the blogosphere. The LBS program serves a huge diversity of learners across Ontario, all united by their desire to upgrade their essential skills so that they can go back to school, gain employment, or live more independently. 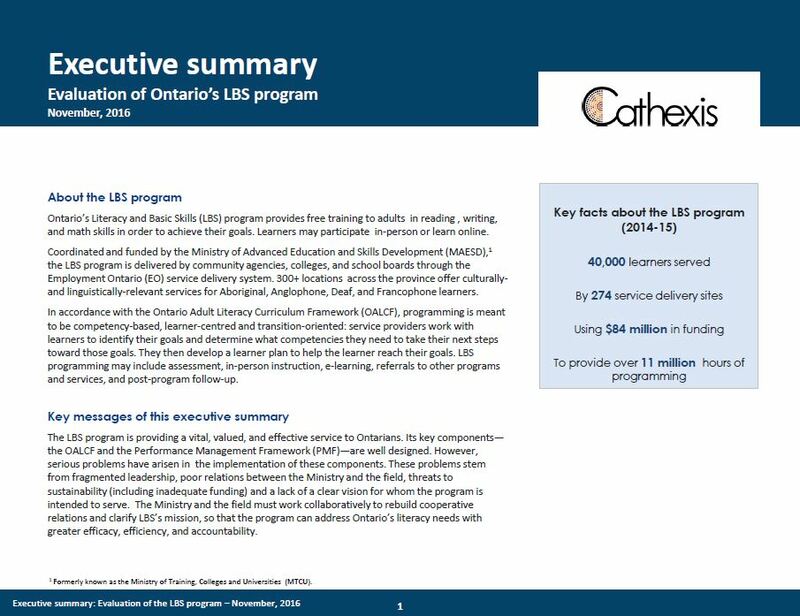 Our evaluation would not have been possible without the participation of hundreds of stakeholders across the province’s literacy system, including learners, community partners, service providers, support organizations, and Ministry staff. Our sincere thanks go out to you for helping to make this evaluation a success.